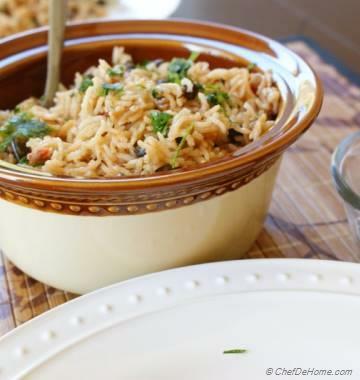 Lamb Biryani is a famous one pot dish. It can be a complete meal in itself. 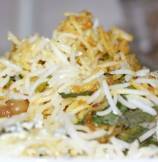 Biryani is a rich dish, cooked with a sort of spicy curry, made with meat or chicken or prawns or vegetables or fish. 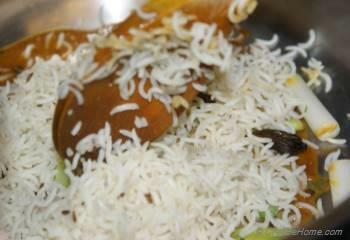 Lamb biryani is perhaps the most popular of all the biryanis. 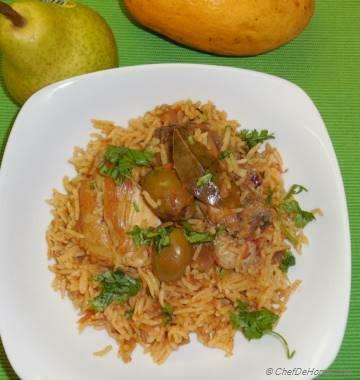 In Lamb Biryani recipe, marinated lamb is simmered with rice and fragrant spices till tender. 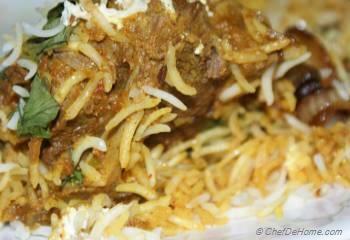 The meat is sandwiched between layers of fragrant long-grained basmati rice and is cooked on dum (in sealed vessel in a hot oven). Traditionally, vessel is sealed with layers of wheat dough, but we are using modern method to seal it with aluminum foil and Dutch oven lid. This is a challenging process as it requires sharp attention to time and temperature to avoid over- or under-cooking the meat. Although this recipe calls for multiple steps, we assure you that it is an easy to cook dish and with elaborated steps given below, you will enjoy cooking it with ease and also will love the end results. 1. Mix well yogurt with 2 tbsp of water. Add Saffron, orange zest and set aside. Heat 1 tbsp oil in pan, add round sliced yellow onions and stir fry till onion caramelize. Drain on paper towel and set aside. 2. 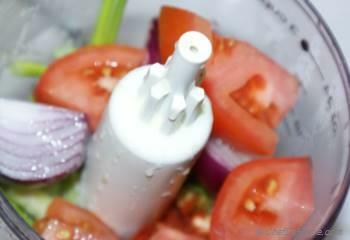 Chop tomatoes, green onion, red onion, hot green pepper, garlic, ginger, 1/4 tsp salt and red pepper powder. 3. Heat 2 tbsp oil in a heavy bottom pan. Add 2 cloves, 2 Cardamon pods green and black. Fry for 1 minute. 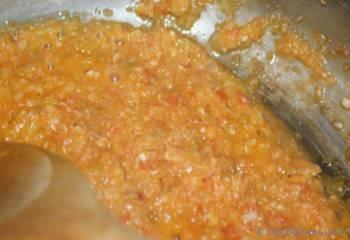 Add chopped tomato/onion mixture. Fry till oil separates. Approx. 10 minutes. Then add turmeric and red pepper powder and fry for 2 more minutes. Add 1 tbsp salt and mix well. 4. 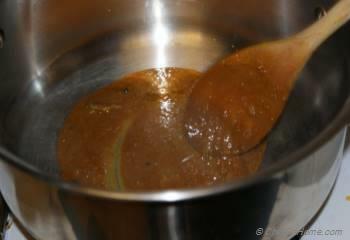 Add lamb to the mixture and keep stirring till lamb caramelize from all sides and oil has separated from onion mixture. 5. Add 2 cup water and bring to boil and cook till lamb is tender 20 - 25 minutes. If using pressure cooker, then use 1 cup water and cook in pressure for approx. 10 minutes. In mean time, wash Basmati Rice and par cook in boiling water. Add 1 Bay Leaf, 2 Cardamom pods and 2 Cloves, 1/4 tbsp salt while cooking. 6. 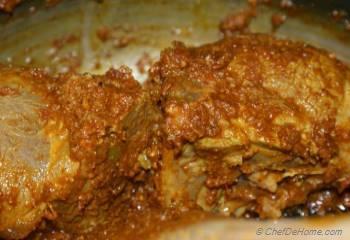 In a Dutch Oven, spread some curry from the cooked lamb at the bottom of pan. 7. Add layer of par cooked rice. 8. 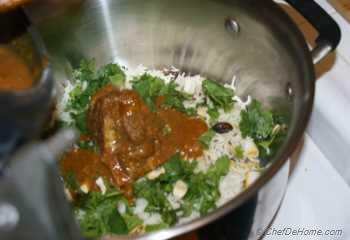 Layer some lamb with curry on top of rice. 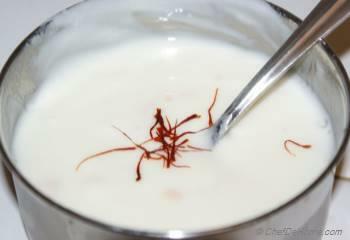 Top it with 2-3 spoons of saffron flavored yogurt. 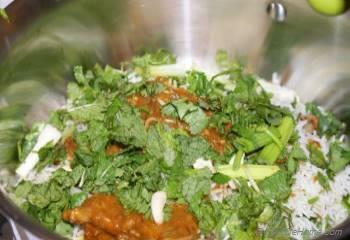 Few leaves of mint, cilantro and 1 tbsp chopped green onion. 9. Repeat Step 7 and Step 8 two more times. 10. Layer such a way that rice layer can be the last layer. Top that layer with leftover yogurt and greens. Top it with caramelized onions. 11. 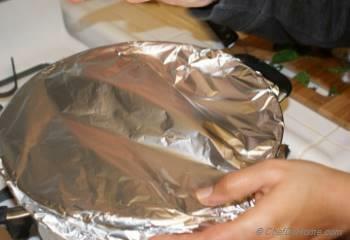 Seal the oven with Aluminium Foil and cover it with Dutch Oven lid. Bake it in pre heated oven at 350 F for 20-25 minutes. 12. 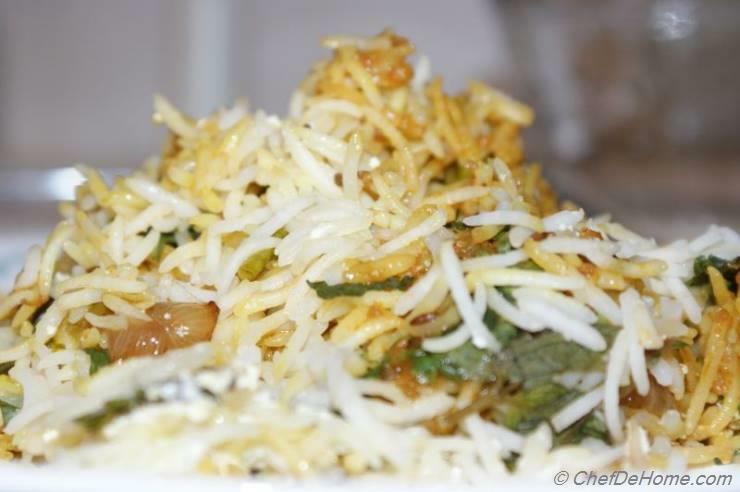 Open it just before serving and enjoy this aromatic delicious mouthwatering Lamb Biryani. Thanks for this easy-to-follow recipe. I'll try it soon. Thanks @QueenOfFoods. Let me know how do you like it. Happy cooking!!! You made my day. I was looking for a detailed Lamb Biryani recipe. I think this is it. 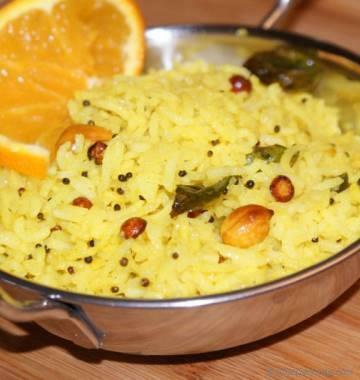 this is my favorite dish whenever I eat Indian. 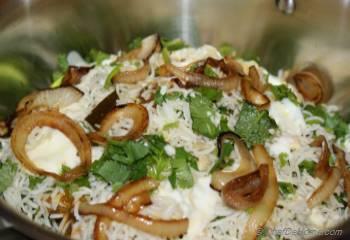 One of my friend cooks excellent Vegetarian Biryani. This looks mouthwatering delicious.